DAR sponsors special programs and public service announcements during the week of September 17 - 23 to help inform and educate the public about this document which is fundamental to our society. The tradition of celebrating Constitution Week was started many years ago by the Daughters of the American Revolution (DAR). In 1955, the DAR petitioned Congress to set aside the week around Constitution Day on September 17th of each year to be dedicated for the observance of Constitution Week, to commemorate the signing of the U.S. Constitution. Citizenship day is also celebrated September 17, a time for all Americans to reflect on the rights and responsibilities of citizenship and what it means to be a U.S. citizen. 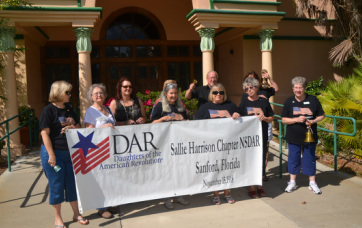 Each year, to kick off Constitution Week, Sallie Harrison Chapter members annually join the official “bell ringing ceremony” on September 17th at 4:00 p.m. This event occurs across the country as thousands of Daughters simultaneously ring bells to celebrate the signing of the U.S. Constitution in September 1787. The Sallie Harrison Chapter works with a high school in Seminole County to bring fun and informative speakers, displays, and contests to the students. Observance of Constitution Week is to commemorate the signing of the Constitution, the ratification of the first ten amendments (known as the Bill of Rights) and the resolution by the U. S. Congress to Observe Constitution Week. For more information about Constitution Week or how your school can participate, please contact us to connect with the Constitution Week Committee Chairman.